In my tradition Lent begins today. A six week season leading up to Easter. A time to slow down and listen for the ways in which that great mystery we call ‘Spirit’ is speaking into our lives. Sometimes the Spirit guides with a nudge, sometimes a slap upside the head. Even so, we often miss the cues. Many of us are over stimulated and over scheduled. Certain politicians foster anxiety and division by telling us whom to fear. In the wake of such busyness and noise…how do we tune in to the ways in which God speaks? Is there a way to get in sync with God’s eternal rhythm? Last week I went on a spiritual pilgrimage to Nicaragua. Our team of ten spent ten days living in Apontillo, a rural, isolated village in the District of Matagalpa. Our team worked alongside local leaders installing 40 water filters and staffing a health fair where we screened for anemia in children. We fell in love with the people. We were hosted by AMOS: Health and Hope http://www.amoshealth.org/ a faith-based mission that empowers communities to develop best practices to ensure basic health care for all. Ada Luz serves as AMOS’ Health Promoter for her community. She is the only accessible health provider for her community of 1300. On Mondays and Fridays she sees up to 40 patients who may walk three hours to see her. The other days she walks the mountainous terrain to visit those pregnant, newborns or those in poor health. She’s always on call for an emergency. It was humbling and inspiring to see how Ada Luz with the support of her community take care of each other. A sense that ‘we are in this together’. In Apontillo we had fewer distractions…no cell reception, no WiFi, no politicians and cable news chumming the waters of fear. Rather, we had time to listen, pray, reflect on Scripture and be inspired by the humble service of people like Ada Luz. Now back in the ‘real world’, I want to hold onto what I learned and the neighborly rhythm we experienced in Nicaragua. I want to spend less time being fearful and more time being generous. Less time excluding and more time including. To hold onto the eternal truth that what truly matters is ‘love’. 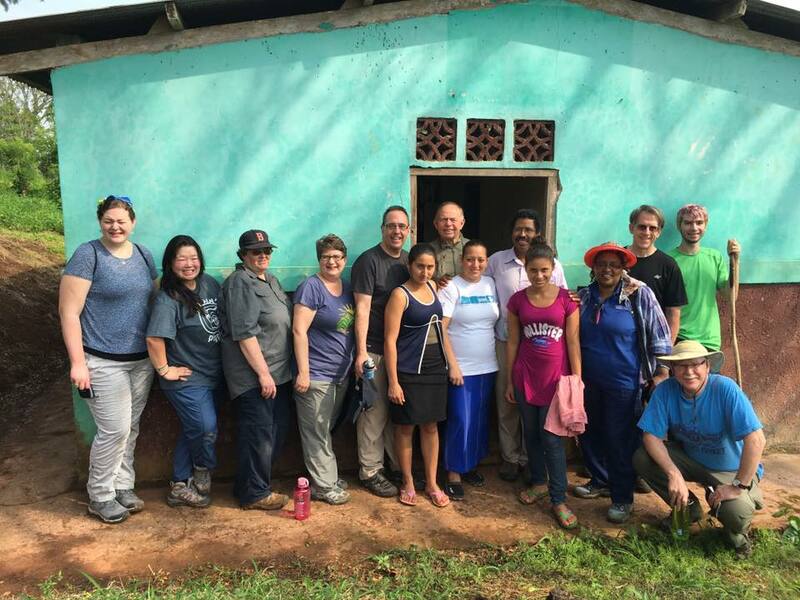 Nicaragua Mission Team with village friends and Ada Luz (in center wearing white). Maybe like me, you are a follower of Christ. Maybe not. But we all need time to slow down. To look around and know that we’re not really all that different. For me the Season of Lent reminds us to be mindful, to focus on what truly matters. To put into practice that which Jesus says is foundational for how to live and be.